Volunteer Marijo Lendak with a patient. Monica Zackeroff loves to play – and win – board games. But what she enjoys more is brightening the spirits of a sick child. 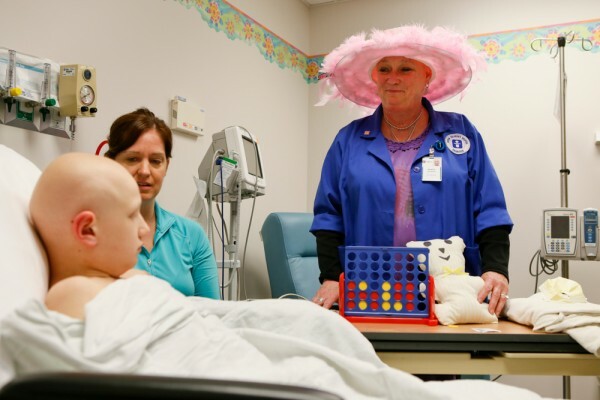 Zackeroff has been volunteering in various capacities at Akron Children’s Beeghly campus in Boardman for a year-and-a-half, and one of her assignments involves interacting with children in the inpatient rooms. She does this by reading books, doing crafts or playing games to give their parents a break. Fellow volunteer Marijo Lendak also experiences the therapeutic value in children’s smiles, both for herself and the child. Both Zackeroff and Lendak started volunteering at Children’s Beeghly campus after retiring from their respective careers. Zackeroff’s volunteer duties include processing mail, interacting with patients in the hospital and screening visitors. Lendak was a literacy coordinator and first grade teacher for Struthers City Schools for 30 years before retiring to care for her mother, and she missed the daily interaction with children. 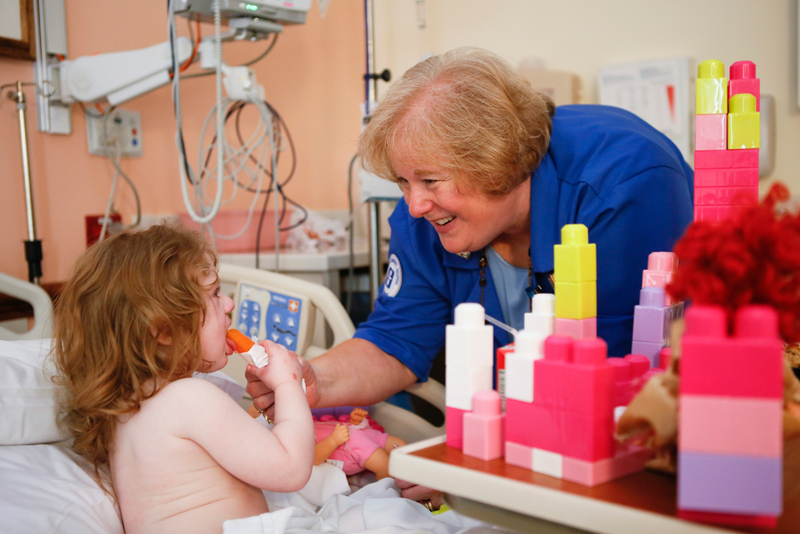 Volunteer Monica Zackeroff loves brightening the spirits of a sick child. She works a 3-hour volunteer shift each week. She helps deliver interoffice mail, and goes in one night per week as a “cuddler” to hold and comfort babies in the neonatal intensive care unit. Volunteer opportunities abound at the hospital, and both Zackeroff and Lendak stress the importance of managing new volunteers’ expectations about the tasks they’ll be assigned and the realities of what they’ll be exposed to in the hospital environment. “Volunteers need to be willing to work with all children, and be comfortable being around children with special needs or who require special care,” Lendak said. Zackeroff stressed that all the tasks assigned to volunteers are vital, even if they’re not ultimately what the volunteer wants. To inquire about volunteer opportunities at our Beeghly campus, call 330-746-8350.